On August 21, 1855, a daughter was born to Jens Frandsen, a blacksmith, and his wife, Kjersten Marie Jensen, in a village called Femmöller in Agri Parish, Randers County, Denmark. They called her Johanne Marie. She had two sisters, Mette, born December 7, 1845, and Karen Marie, born April 19, 1850, and two brothers, Frants Peter, born March 13, 1854, and Jens Christian, born November 25, 1858. Her parents had had three other children, including twins, who died in infancy. Karen Marie died at the age of ten on August 6, 1860. As an infant, Johanne was baptized into the Lutheran Church, but in 1862 her parents were converted to the Church of Jesus Christ of Latter-day Saints. On April 27, 1866, at the age of ten, Johanne was baptized into the Church at Aarhus Branch in Denmark. She was confirmed on April 29. Three weeks later, in May 1866, her family left their home to begin their emigration to Zion. They went to Copenhagen, then to Hamburg, Germany, where on May 25, 1855 the ship Kenilworth lifted anchor in the River Elbe and commenced its long voyage across the North Sea and Atlantic Ocean, with Jens and Kjersten Frandsen, and their children Johanne Marie, Frants Peter, and Jens Christian among the 684 souls on board. Their oldest child, Mette, had married Søren Sørensen on October 13, 1856 and apparently remained in Denmark. The trip was made with favorable winds for about three weeks, but there were continuous headwinds and fog for the next five weeks, which made the voyage both long and dreary. The ship’s crew treated the passengers in a kind and generous way, allowing them all the privileges that could reasonably be expected. The provisions were satisfactory and the sick received good attention, though eleven or twelve persons died during the voyage. The ship anchored off Staten Island on the evening of July 16, and the following day, an exceedingly hot day, the immigrants disembarked at Castle Garden, New York. The Mormon immigrants next traveled on a large freight steamer to New Haven, Connecticut, then by train through New England, into Canada, through Michigan, Illinois, and Missouri. They arrived in St. Joseph, Missouri on July 27. From here they took a steamboat up the Missouri River and two days later reached Wyoming, Nebraska where teams and wagons sent by the Church were waiting for their arrival. Jens Frandsen’s family joined the ox train of Captain Joseph S. Rawlings which left Wyoming on August 2, 1866 and arrived in Salt Lake City on October 1st. It is said that Johanne walked this long distance from Nebraska to Utah. Johanne’s family probably stayed in Salt Lake City until about 1870; then they settled in Huntsville where her father worked as a blacksmith. 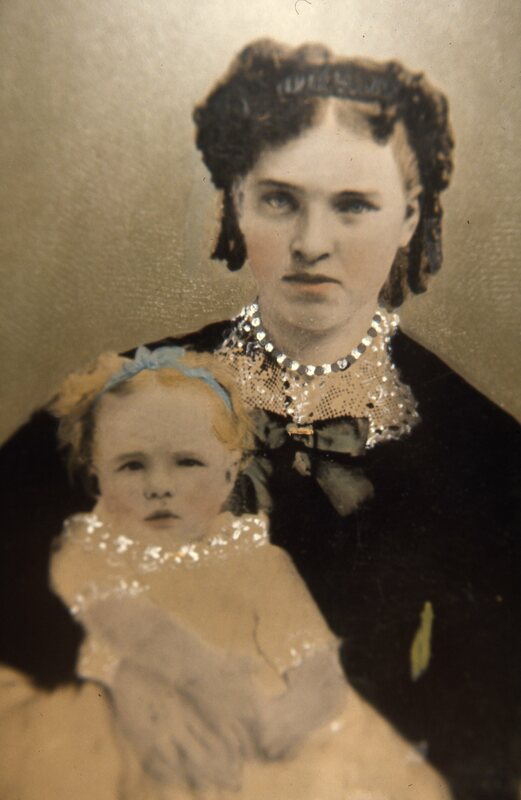 On June 26, 1871, two months before her sixteenth birthday, Johanne Marie Frandsen was married to William Halls in the Endowment House in Salt Lake City, becoming his second wife. William had married Louisa C. Enderby ten years earlier and already had five children. One more child was born to Louisa after William’s marriage to Johanne. In 1880, William married Eleanor Howard, who gave birth to one daughter before dying in childbirth in 1884; that son was stillborn. William provided a home for Hannah (as she was commonly called) in Huntsville and here she lived for almost fourteen years. During this time she gave birth to eight children, Johanna Susanna, Mary, David, twins Lucy and Emma, Sarah, James Lewis, and Eliza Moiselle. While Hannah was anticipating the birth of Eliza, she was making preparations to take her family to settle in southern Utah. By this time the federal officers were making strong efforts to arrest men who were living in polygamy, and so on March 7, 1885 Hannah put all her possessions and her seven children into a wagon and, carrying three-week-old Eliza, left Huntsville with her husband to help settle the rugged country of the San Juan mission. William’s first wife, Louisa, remained in Huntsville with four of her children and Eleanor Howard’s child, but William took Louisa’s sons William and Thomas with him to settle in southern Utah. Accompanying them on their pioneering journey were Francis A. Hammond and his family, Samuel S. Hammond and his family, and William’s brother, George Halls, and his wife, Moiselle. They drove wagons and a herd of loose stock, arriving in Bluff in May, 1885. Four more children came to Hannah and William after they made their home in Mancos. Franklin, Eleanor, Herbert, and Florence “were born in the log house. Grandmother Frandsen lived with us and I still wonder how fifteen people could live in such a small space.” (FHG) Hannah’s brother Peter also lived with them for a while. Another brother worked in the mines in Ouray, Colorado and visited occasionally. For a number of years Hannah took some of the children with her and went up into the east Mancos hills in the summertime to tend the cows. “I remember the many seasons she took Frank, Bert and me up into the hills. Bert and I were younger, but Frank was a real help and comfort to her.” (FHG) She made cheese with the milk, much of which she sold to buy winter clothing for the children. They stayed in the hills all summer with only an occasional trip into town to take milk and cream and cheese and get fresh supplies. Many times she took bouquets of columbine back to her friends in town. “Life for Hannah became somewhat easier when her children neared adulthood and she had a large and comfortable new house built. The fruit trees she had planted were bearing fruit and the boys helped with her large gardens. After the new home was built just west of the old log house, she sent away for some locust trees which she planted herself in a long row to the west of the house and garden to act as a protection from the wind and storm and to take the place of the old rundown fence. The trees grew and thrived, and made a neat appearance.” (LHF) When her oldest son David’s family became too large for the old log house where they were living, it was decided to build a smaller house for Hannah up on the hill just north of her present home. It was a beautiful home and Hannah took great pride in it. She planted flowers and fixed up her yard with loving care. David and his family then moved into the big house. Hannah raised a family of good-looking, intelligent, and talented children. Three of her sons, David, J. Lewis, and Herbert went on missions. David served as bishop and stake president, J. Lewis served as bishop, and Herbert served in many church offices. Three of her daughters taught school. Anna and Mary were the first to teach in the Webber community school. Eliza also taught and was a talented pianist. Florence became a registered nurse. Hannah enjoyed the pleasure of her new home for only a few short years, for her worn-out body gave out and she passed from this life on December 15, 1913 when she was but fifty-eight years old. The doctor diagnosed her illness as diabetes, but “as she was not one to be an invalid, she was in bed only three days before her painful death.” (FHG) Her life, though short, was very full and she accomplished more in her few short years than many do in a much longer time. She left many friends, children as well as adults. The good she did still lives after her. Her husband lived seven years after her death. They are both buried in the Webber cemetery at Mancos, Colorado. JOHANNE’S CHILDREN: Johanna Susanna, born January 29, 1873; Mary, born August 29, 1875; David, born October 12, 1877; Lucy and Emma, twins, born November 4, 1879; Sarah, born November 21, 1881; James Lewis, born June 23, 1883; Eliza Moiselle, born February 15, 1885; Franklin, born July 12, 1887; Eleanor, born August 21, 1889; Herbert, born October 5, 1891; and Florence, born March 12, 1894. Scald one quart milk. Melt 1/8 lb. butter; add one cup milk. Stir in one cup of flour and beat until smooth. Add a small amount of scalded milk and cook until thick, stirring constantly. Add one teaspoon salt. Pour out on plates; sprinkle generously with sugar and cinnamon, and dot with butter. Combine two cups mixed dried fruits (currants, raisins, prunes, pears, apricots, peaches, and apples), three cups water (one-half may be grape juice), one-half lemon, sliced, one very small stick cinnamon, a few whole cloves, one-fourth teaspoon salt, and one-half to two-thirds cup sugar. Cook covered until fruits are tender, about 40 minutes to one hour. Serve hot or cold.